So what was the recent problem I was facing that got me all bent out of shape? It had to do with Lead Generation forms, which are a staple of B2B websites like mine. Let me explain. Many websites out there, especially B2B websites, have Lead Generation as their primary objective. 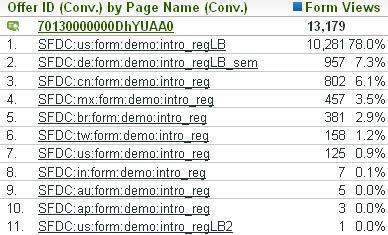 In past blog posts, I have discussed how you can track Form Views, Form Completes and Form Completion Rates. However, over time, your website may end up with lots of forms (we have hundreds at Salesforce.com!). In a perfect world, each website form would have a unique identifier so you can see completion rates independently. That isn’t asking too much is it? However, as I have learned, we rarely live in a perfect world! Through some work I did in SiteCatalyst, I found that our [supposedly unique] form identifier codes were being copied to multiple pages on multiple websites. While this causes no problems from a functionality standpoint – visitors can still complete forms – what I found was that the same Form ID used in the US was also being used in the UK, India, China, etc… Therefore, when I ran our Form reports and looked at Form Views, Form Completes and Form Completion Rate by Form ID, I had no idea that I was looking at data for multiple countries. For example, if you look at this report nothing seems out of the ordinary right? At first, I thought I was going crazy! How can this unique Form ID be passed into SiteCatalyst on eleven different form pages on nine country sites? This caused me to dig deeper, so I did a DataWarehouse report of Form ID’s by Page Name and found that an astounding number of Form Pages on our global websites shared ID’s. Suddenly, I panicked and realized that whenever I had been reporting on how Forms were performing, I was really reporting on how they were performing across several pages on multiple websites. In the example above, I realized that the 34.669% Form Completion Rate I was reporting for the US version of the form in question was really reporting data with the same ID for forms residing on websites in Germany, China, Mexico, etc… While the majority was coming the the form I was expecting, 22% was coming from other pages! Not good! So there I was. Stuck in web analytics hell, reporting something different than I thought I was. What do you do? The logical solution was be to do an audit and make sure each Form page on the website had a truly unique ID. However, that is easier said than done when your web development team is already swamped. 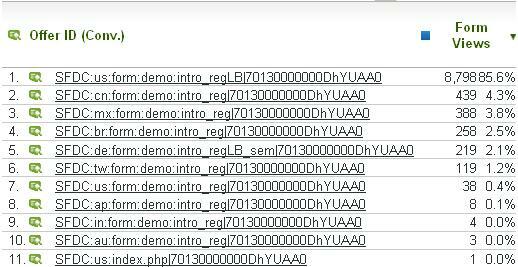 Also, even if you somehow manager to fix all of the ID’s, what is preventing these ID’s from getting duplicated again? We looked at all types of process/technology solutions and then realized that there is an easy way to fix this by doing a little SiteCatalyst trickery. However, there is one tricky part of this solution. While it is certainly easy to concatenate the s.pagename value with the Form ID on the Form page, what about the Form Confirmation page? The Form Confirmation page is where you should be setting your Form Completion Success Event and that page is going to have a different pagename. If your Form ID report doesn’t have the same Page Name + Form ID value for both the Form View and Form Complete Success Event, you cannot use a Form Completion Rate Calculated Metric. For this reason, you need to use the Previous Value Plug-in to pass the previous pagename on the Form Confirmation page. Doing this will allow you to pass the name of the “Form View” page on both the Form View and Form Complete page of your site so you have the same page name value merged with the Form ID. Well there you have it. A very specific solution to a specific problem I encountered. If you have Lead Generation Forms on your website, maybe it will help you out one day. If not, thanks for letting me get this out of my system!